Grammatical intricacy is an important concept in charactering complexity of language (Halliday, 2008). However, this concept has not yet been fully investigated in the teaching and learning of English as a foreign language (TEFL), particular in English as a foreign language (EFL) textbooks in higher education. This paper aims to examine grammatical intricacy across textbook levels in a book series used in tertiary education in the Vietnamese context. This is part of a larger research project looking at linguistic complexity of English textbooks in the TEFL setting. The research employed Systemic Functional Linguistics (SFL) as the main theoretical framework and Halliday’s method as a measure of grammatical intricacy to look at how this language feature was used in reading comprehension texts in four textbooks at different levels including elementary, pre-intermediate, inter-mediate and upper-intermediate. The findings revealed that grammatical intricacy increased in accordance with the book levels. Particularly, the mean scores of grammatical intricacy showed a gradual increase from the elementary to the intermediate book level; though they were not different significantly and the upper-intermediate textbook did not show the topmost grammatical complexity. 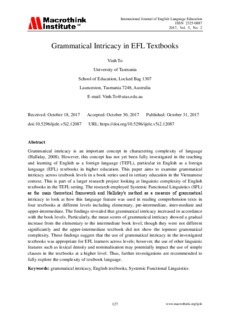 These findings suggest that the use of grammatical intricacy in the investigated textbooks was appropriate for EFL learners across levels; however, the use of other linguistic features such as lexical density and nominalisation may potentially impact the use of simple clauses in the textbooks at a higher level. Thus, further investigations are recommended to fully explore the complexity of textbook language.